Charlotte Tilbury in Amazing Grace: stunning dusty rose shade with a coral undertone to it from the Matte Revolution range. I just love this lipstick (the packaging, the shade and the formula), everything about it really is amazing. Even though it's a pricey £23, I can assure you it's worth it and not to mention that you can't go wrong with owning a luxurious product like this. 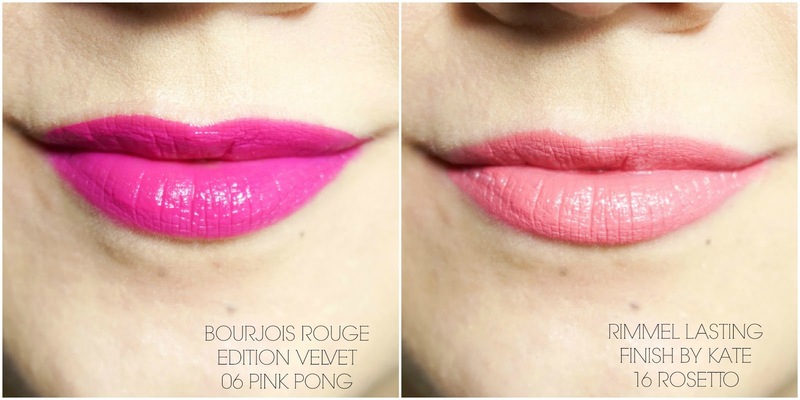 Bourjois Rouge Edition Velvet in Pink Pong: surprise, surprise I just had to include a liquid lipstick in here (obsessed much) and I'm not sure if I've ever featured this particular lippie on the blog before. It's not exactly a shade I wear often because it's very in your face, but then again that's what I love about it. The pigmentation of this lip product is fantastic and the formula is on point. If I do decide to wear a bright shade like this I want it to last well on the lips yet be comfortable at the same time, which this does amazingly well. I will be sure to pick up more shades from the range soon. 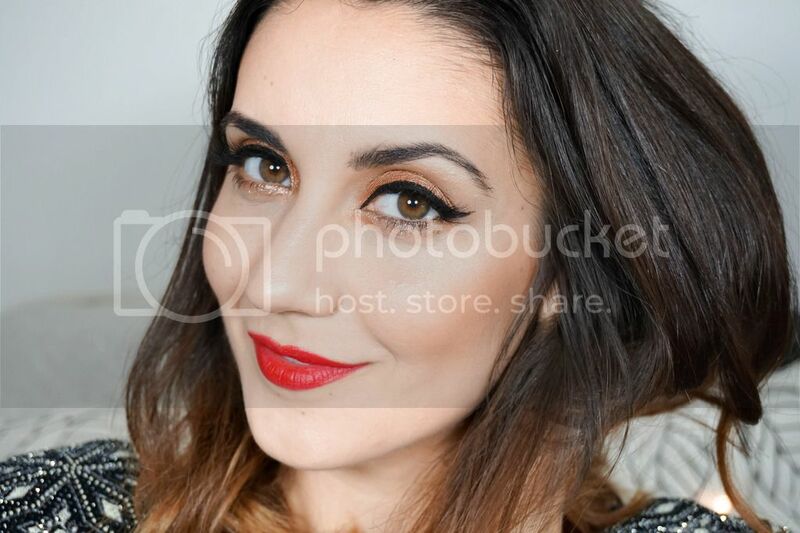 Rimmel Lasting Finish Lipstick By Kate in Rosetto: a peach toned lipstick with a pink undertone and a light reflecting finish which is also made to last. The lipstick is creamy and feels comfortable, yet it lasts quite well on the lips until you start eating/drinking when it start fading and becoming uneven. Another great thing about Rimmel lipsticks is the affordable price and the fact that you have a huge selection of shades to choose from, meaning there is something for everyone. 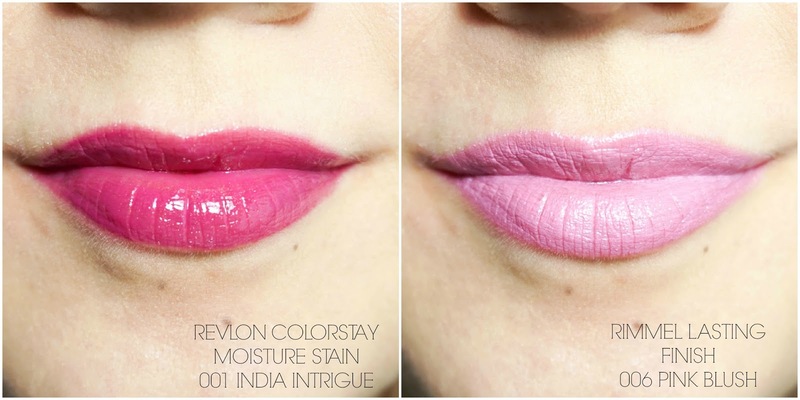 Revlon Colorstay Moisture Lip Stain in India Intrigue: a glossy raspberry pink shade that leaves a lovely stain on the lips once the shine fades away. I personally love this product but I know it has received mixed reviews in the beauty world and I think the shade you choose plays a big part because apparently the lighter ones don't work as well as the darker ones. I enjoy the non sticky formula of this and the fact that it feels moisturising on the lips. 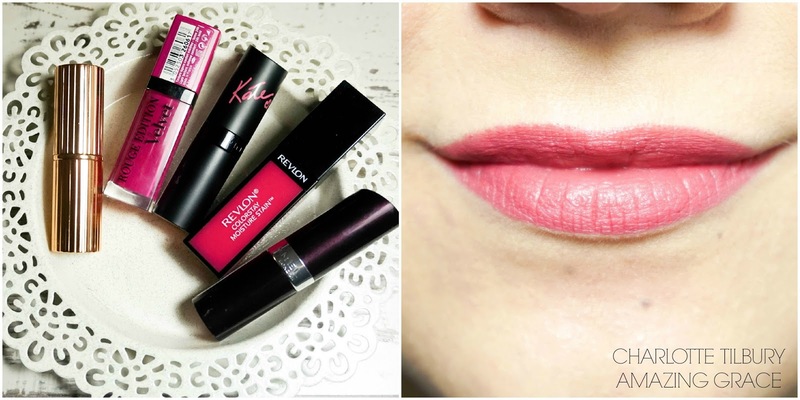 Rimmel Lasting Finish in Pink Blush: this cool toned pink with a frosty finish is definitely not everyone's cup of tea and I even find myself on the fence about it as I don't think I can pull it off when it is full on like the photo above. However I did want to include it because once again it's an affordable option from Rimmel, it feels creamy and smooth on the lips as well as having a good lasting power. If I pat this on the lips using my finger rather than applying it straight from the bullet it is more forgiving and easier to wear. So that's my current spring shades and ones that I will see myself wearing through the summer. As mentioned above they are not exactly my only favourite shades because I do have a lot more especially recent purchases but I just wanted to show you something different. 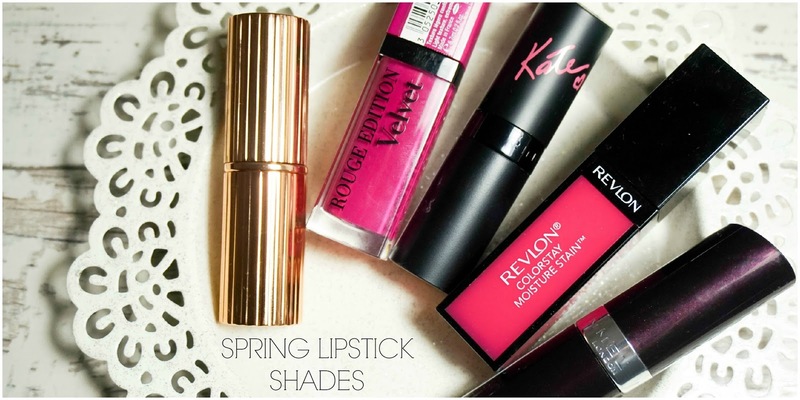 What is your favourite spring/summer shade that you just have to have this time of year?